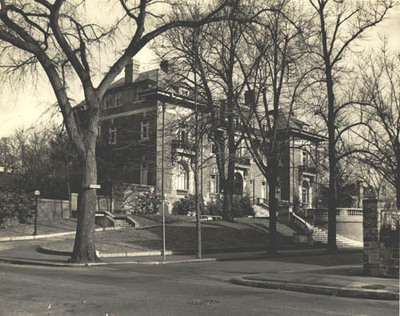 Black and white photograph of South Hall, located at the corner of Young Orchard Avenue and Hope Street on the elegant East Side of Providence, RI. The former Bryant and Stratton Business College, newly named Bryant College of Business Administration, moved to South Hall on August 1, 1935 after the building came up for long-term lease. Prior to this the building housed the Hope Hospital. In the nineteenth century the building had been the home of a famous manufacturing family by the name of Sprague. Isaac Gifford Ladd, a broker, had purchased the mansion in the early twentieth century and remodeled it to resemble a French chateau. Note the building's wrought iron railings and ornate archway at the front entrance. The archway became a tradition where graduates processed through it during Class Day exercises and future Commencement ceremonies. Gradually, the College expanded as neighborhood homes came up for sale or lease in the East Side neighborhood. With the acquisition of these multiple buildings Bryant developed into a residential college.